Next year marks the 25th anniversary of Mike Mignol's Hellboy, with Dark Horse Comics announcing Hellboy Day to celebrate. 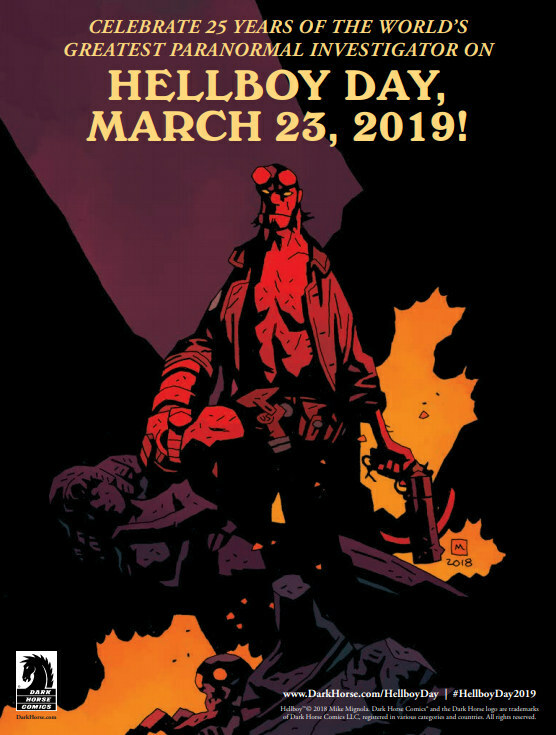 Next year, on Saturday March 23, 2019, Dark Horse Comics will celebrate the 25th anniversary of legendary comic book creator Mike Mignola’s most famous creation with Hellboy Day. In 1994, Dark Horse Comics published the debut issue of Hellboy: Seed of Destruction and introduced comic book readers to the Right Hand of Doom, the Bureau for Paranormal Research and Defense, and one of the most iconic comic book characters—and universes—of all time. For 2019’s Hellboy Day celebration, Dark Horse will publish a 25th anniversary, promotional edition of Hellboy: Seed of Destruction issue 1, featuring a new cover by Mignola and colorist Dave Stewart, which will be given away at participating comic book shops; and select stores across the country will host Hellboy Day events. “When I created Hellboy way back when I never imagined he would be around long enough to celebrate a 25th anniversary,” said Mike Mignola. “I’m grateful to the writers, artists, colorists and letterers who’ve joined me in telling Hellboy stories for all these years. And, of course, so grateful to the fans. This thing could not exist without their support and it’s a pleasure every time I get to go out to meet them.” Mike Mignola will appear at a Hellboy Day signing at Earth 2 Comics in Sherman Oaks in Los Angeles on March 23. Dark Horse is inviting comic book retailers to celebrate this milestone anniversary for the world’s greatest paranormal investigator by holding store events and sales of Hellboy titles. In addition, Dark Horse will be creating a series of Hellboy Day promotional materials for retailers, including a Hellboy Tattoo Sheet, a Right Hand of Doom bookmark, a window cling, an open/close sign, and a new, folded version of the Hellboy double sided poster and Mignolaverse timeline that debuted at New York Comic Con. Retailers will have the chance to order promotional, giveaway materials and are invited to take advance of additional backlist sale pricing in order to hold celebrations at their stores. Qualifying retailers who take advantage of backlist sales promotion will be automatically entered to win special prizing packages from Dark Horse. For nearly 25 years, Mignola and a host of celebrated writers and artists have chronicled the adventures of Hellboy facing his supposed destiny as Beast of the Apocalypse, and explored the mysterious backstories of B.P.R.D. agents including Professor Trevor Bruttenholm and Abe Sapien. Hellboy’s adventures have appeared in what are known as the Mignolaverse — the strange, shared universe of comic books and graphic novels, comprised of acclaimed titles including Hellboy & the B.P.R,D., Abe Sapien, B.P.R.D., Crimson Lotus, Frankenstein Underground, Lobster Johnson, The Visitor: How and Why He Stayed and Witchfinder. Hellboy has appeared in graphic novels and comic books, prose novels and short story collections, two animated features, two live action films, toy lines and all manner of merchandise. Neil Marshall’s forthcoming Hellboy film starring David Harbour, Sasha Lane, Ian McShane, Penelope Mitchell, and Milla Jovovich will be released by Lionsgate on April 12, 2019.